Achille Agway has been in business for over 50 years. 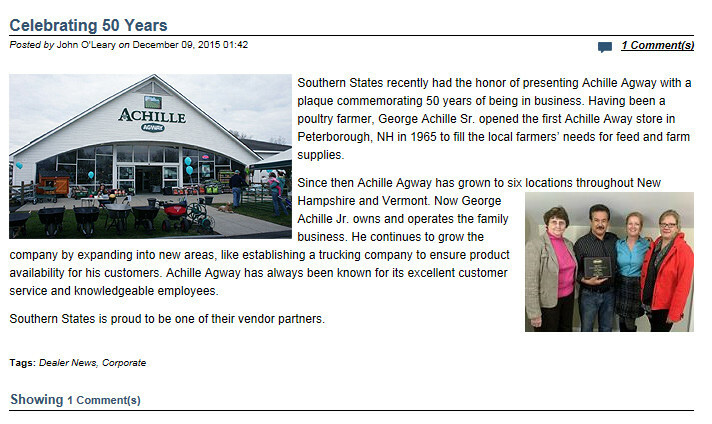 It was started by George Achille, Sr. as a poultry farm in the 1950s. George was a carload customer purchasing his feed from Eastern States. This soon grew into a side track business supplying feed to other local farmers. This venture was so successful he opened his first store in Peterborough, NH in 1965. This location was expanded in 1977. The second store, Keene, NH was opened in 1981. A new store was opened in 2000 on this location, 80 Martell Court in Keene. In 1986 the third store was added in Hillsboro, NH. Then the company expanded into three additional stores: Milford in 1988, Walpole in 1996 and Brattleboro, VT in 1999. This location was an Agway, Inc. store. George Achille Jr. now owns and operates the family business. The company continues to grow by utilizing his father’s business plan and adding his ideas to the plan. A good example is the establishment of a trucking company to ensure product availability at the best landed cost. George uses the company to haul store incoming products as well as to make deliveries for other companies. Achille Agway is known for its excellent customer service and knowledgeable employees. We are prepared for every season at Achille Agway! In the Northeast, part of meeting the needs of the farm and home and garden retail customer is being prepared for whatever season is next. Read more on how we prepare and the products we have to offer from our very own George Achille, owner of Achille Agway.